Have you ever wondered what a full day of chocolate would look like? It seems so decadent and surely is nutritionally deficient, right? Not really, it turns out. These are reposts of my favorite chocolate recipes and are in keeping with the cacao nib giveaway below. In the macronutrient count, this menu isn't greatly different from any other I've done. It's actually lower in fat that many of them. 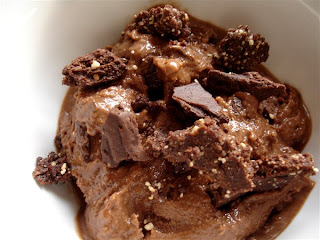 So yeah, get your cacao on :) (I used cocoa powder for many of these recipes, which is about $.05 per tablespoon, but even the best raw cacao powder is only about $.20 per tablespoon). Break frozen bananas into pieces. 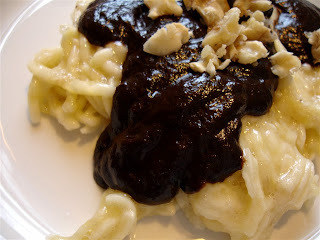 Puree until smooth in blender with the nut milk, cacao powder, vanilla and salt. 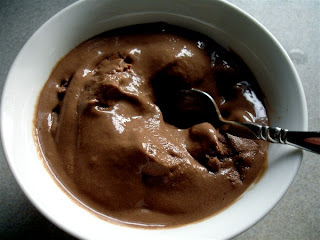 This will have the consistency of a very thick chocolate shake or pretty loose soft serve ice cream. Pop into the freezer for an hour or so to firm up, if desired. 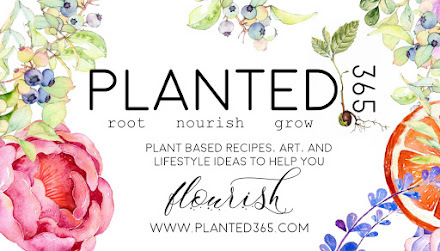 Kelli from over at her animal friendly eating blog!!! Yay, Kelli! Shoot me a message and we'll get the shipping details arranged! 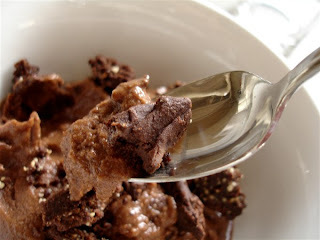 The folks over at snubbr.com are sponsoring this giveaway for some yummy raw cacao nibs. Snubbr.com is an online answer service, kind of like is Yahoo Answers but for shopping advice. "If you're looking to buy a new cookbook or blender, you can just ask the experts at snubbr.com, and we'll search the entire web for the ideal product for you, saving you time and stress." To enter, just leave a comment below. It doesn't have to be about chocolate, but I'd love to hear what some of your favorite raw chocolate treats are! Deadline is next Sunday, March 28, at 10 pm. I would Love some raw cacao! By the way, I made the cheezcake you had back around Valentine's Day. I was the best raw cheezcake I've ever made, and my kids loved it. I put it in a 7" springform, and there was enough for 8 slices. The chocolate crust was divine. 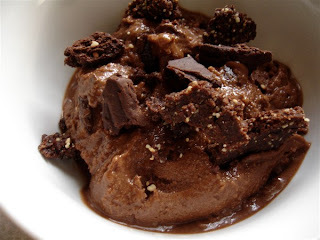 This post is full of such delicious chocolate recipes! Will definitely give them a try (esp. the last one, extra chocolatey)! I too would LOVE some caocao! I just started reading your blog and it's proving to be a great resource! Thank you! I love cacao nibs mixed in trail mix. Love the all chocolate day! I will definitely be ordering some buckwheat groats. I'm really fond of a chocolate cherry smoothie, recipe in Matthew Kenney's Everyday Raw. Thanks for the opportunity to get some nibs! I enjoy your blog. I enjoy your blog so much. I'm still learning about eating raw and am fascinated by your creativity. Your photos are awesome, too! I've never tried raw chocolate, except in some of the raw "candy" bars at the health food store. I love your blog! 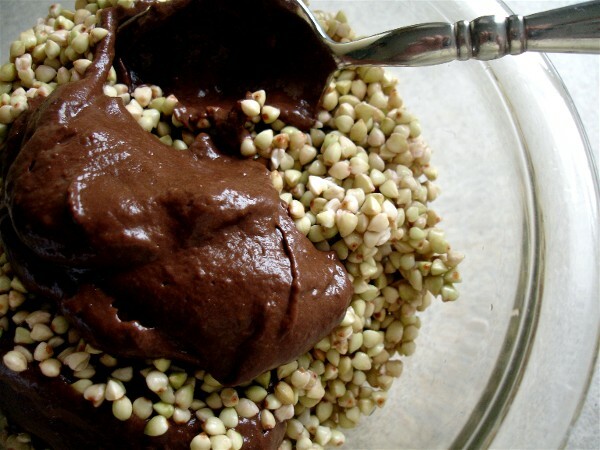 My favorite chocolate dessert is raw chocolate "mousse", which everyone in my house enjoys. A chocolate DAY! Oh I've had those before. :-) But not so artfully crafted as this. I would like to enter. Because I need a steady stream of cacao around here. 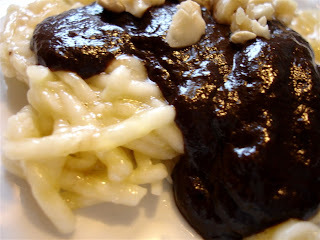 I LOVE anything with cacao in it !!! my latest addiction has been ice cream with almond milk,banana,and cacao and raw agave..I love making everything myself !! and I don't feel the "guilt" like I used to when I ate store bought processed "stuff"...I know when I eat MY ice cream version I am doing my body good!!! Oh and almond milk with cacao in it !! AWESOME!! 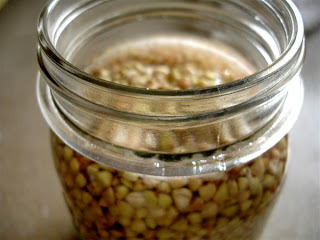 Found your blog thru raw food rehab and WOW what a WONDRFUL blog!!! Raw on a budget can actually be done !! Thank you so VERY much for your blog!!! I am new to RAW and am so inspired!! 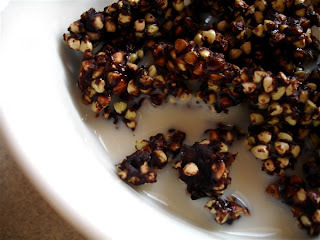 I'm making the buckwheat coco puffs today!! (I actually am skipping school, this is a far greater thing to accomplish). What should the heat setting be on the dehydrator though? 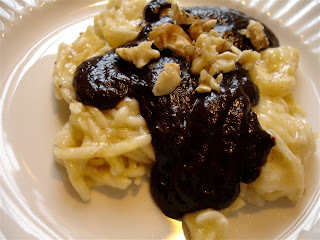 YUMM i would love to have some of this..i love chocolate!!! My favorite chocolate of course is in the form of zucchini brownies yumm! I love putting a tsp of cocoa in a cup of almond milk and making a hot cocoa. It's delicious! I would love to win the cocao nibs, been dying to try them! chocolate is probably the BEST smoothie ingredient ever invented! also, i love to end my day with a little bit of dark chocolate as a treat... i'm actually having a hard time thinking of a recent day that i DIDN'T east any chocolate! Am thankful for your wonderful recipes. And happy that I am not the only one that eats a whole day of chocolate...occasionally. Havent tried the nibs yet, been satisfied with the butter and powder. Would be awesome to win. I totally love your $10 a day blog it's such a perfect idea, thanks for posting! I've been wanting to try raw nibs for the longest time!!! A day full of chocolate. I love it. I put it is my smoothies, puddings and n'ice creams, like that yummy one you have there. I even like to use it in savory dishes like raw chili. Mmmm! I just love your blog, you help so many people understand how easy this lifestyle is in a way that is easy for the average person to understand. BRAVO! 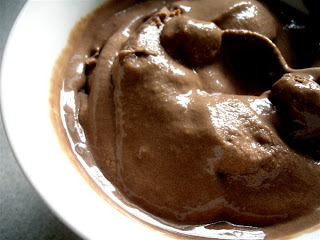 When I first went raw I ate raw chocolate mouse every day for 2 weeks until my sweet tooth curbed itself, so its nice to know that chocolate is my friend! LOVE the recipes, can't wait to make the ice cream for friends tomorrow and the buckwheat crispies for breakfast tomorrow! Thanks for all the great ideas!!! Made your buckwheat crispies and I'm so in love with them!! I am loving your blog and tried a carrot soup you posted awhile ago. I will be eating that for lunch. 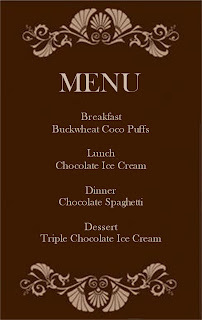 The all chocolate day looks fun and I think my girls (2,4 and 7) would love the "spaghetti"! I am so happy I found your blog especially since I'm among the recently unemployed. Winning the nibs would definitely help make my life a litter sweeter. I follow @snubbr on Twitter. Wow, you're an amazing food lover. I'll definitely try all these myself. Thanks for recommending these Cacao nibs. More power! Love your site! keep going! 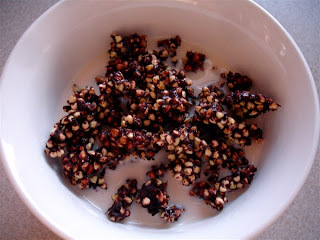 these buckwheat crispies, are fantastic, i already made different flavours. they are delicious! Love the post and the blog! Your blog rocks! Keep-up the great work. I tell my friends to check-out your site when they want to try the 'raw lifestyle' since your recipes are laid-out and are quick n' easy to do. Thank-you for all of this! Ok..cacoa. I especially like to add cacoa nibs to my breakfast smoothies. Simply grind the nibs, toss it into the blender with some almond milk, frozen berries, a dash of vanilla powder and a bit of hemp seed and voila! You have a healthy chocolate strawberry smoothie. Oh my goodness!!! It looks sooo good!